Premiering a new age in the Lorraine region: the new architecture of culture. The economical transformations of the 90s have significally influenced the destiny of Lorraine and Rurh regions. As a result, this North-Eastern part of France has faced a sharp increase in unemployment due to the closure of the mines and the end of the industrial drive of the area. Freyming-Merlebach, the location of the new 'Théodore Gouvy' Theatre is one of those cities. In this context, culture is seen as one possibility for resolving the accompanying social and economic difficulties in the town. Since that the historic theatre in Freyming-Merlebach had deteriorated, and a number of cracks appeared as the result of disused underground tunnels, it was decided to built a new one, givent that the old 500-seat auditorium had also become too small. The site decided for the 'Théodore Gouvy' theatre is on the Place des Alliés, close enough to the town centre, but conveniently located neat the new town hall and a shopping centre. It has quickly become a symbol of the town's renewal, thanks to its pluri-disciplinary program, that covers every area of live performance: classical and contemporary theatre, musical theatre and opera, dance. To celebrate the opening of the theatre designed by Dominique Coulon & associés, WE ARE CONTENT(S) created a video. 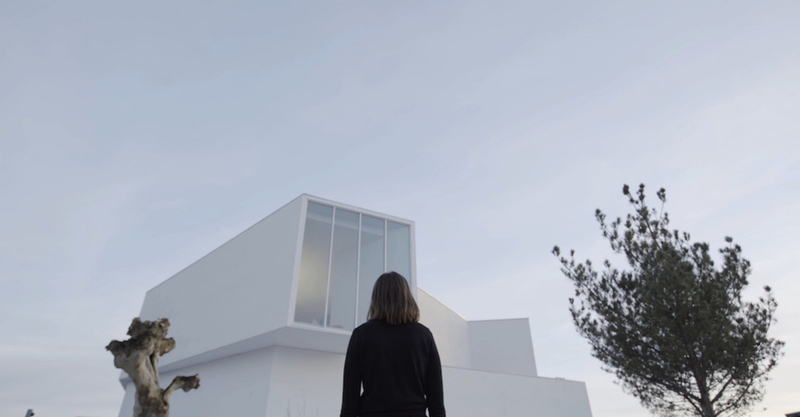 The setting, of course, is the theatre itself and despite the narrative of it - a woman navigating the space - being quite conventional, the quality of the images and the surprising views on the building make this video an outstanding one. To start with: the theatre sets up an energetic dialogue with the heterogeneous urban landscape, shaping itself to fit the context and logic of the existing flows - the video celebrates it shooting the woman from below and from above, using her not just as a prop, but more has a presence, living up the space. However it is when one goes inside, that is able to admire the majestic interiors. The visitor's interest is caught by the animation of the volumes and perfectly captured on tape: in the upper part, the foyer is offset to indicate the entrance, while in the lower part, transparent elements allow glimpses of the wealth of interior routes and invite the visitor to enter. Oblique lines reiterating the complex geometry of the site cause spaces to expand, creating a feeling of space. Repeated shots are dedicated to this complexity: while the natural light enhances the various faces and reveals the building's shape and dimensions. The foyer and public areas are flooded with natural light, varying throughout the day with the course of the sun. This evolutive, dynamic spatial staging echoes the very image of the theatre. The building presents the town with an immaculate white facade, while the foyer is in shades of beige. The 700-seat auditorium constitutes a complete break with the foyers. Red, pink and orange lend density to the space, affirming it as the main feature of the project, with colour sanctuarising the idea of performance. It is here that the video stops, making us eager to see more, to partecipate the events hosted in the 'Théodore Gouvy' theatre.